Diabetes and Your Child: Insulin Pump Benefits and Concerns. By inserting an infusion set which can be used for 2 or 3 days, the insulin pump can be used without having to be injected 3 or 4 times each day. The pump assists to give better control over blood sugar by correcting low and high blood sugar levels. Diabetics with insulin pumps are in a better position to reach their targeted A1C level than diabetics using a number of injections daily. Diabetics using the pump get more flexibility, freedom and convenience. It is so much easier for most children and their parents to press some buttons to get the pump to send in the insulin. There is no worry about having to send insulin into the body on days when the whole family wishes to wake up at any time they want. With the insulin pump, the diabetic can have meals at times different from one day to another. The pump allows adjustment to be made to cater for meals portions which are different from the norm. When bathing, showering or swimming, the pump can conveniently be removed. Since the pump allows adjustment to be made for various changes in activities such as sports and school functions, the children and their parents find the pump useful. Another benefit for children is that a pump can send into the body such minute quantities which no syringe or pen can. With the Medtronic insulin pump, its software programs are able to record the type of activity, the quantity of carbohydrates eaten, and the level of blood glucose which can be available to the doctor and the patient for better assessment of the treatment. Programmable reminders are available to pump users to remind them on the any additional amount of insulin to be taken with their meals or to make sure that the diabetics test their blood glucose two hours after a meal to find out if the right amount of insulin had been sent in. There must be effort and commitment from both the parents and their child in the use of an insulin pump. 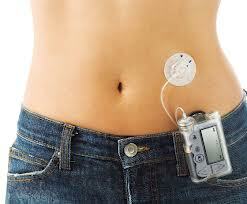 Users of the insulin pump must have good enough eyesight and hearing to notice the alarms and alerts from the pump. Remember to adjust the pump so that it sends in a bigger amount of insulin for some meals and when the blood sugar level is high. For that matter, check your blood glucose level often. Such matters can be forgotten during busy days. Fortunately, the pump can be set to give reminders. Usually, the cartridge or the reservoir together with the infusion set can only be used for three days at the most and have to be replaced regardless of whether the cartridge or the reservoir is empty or not. Sometimes, the time to replace may be earlier, especially when the weather is too warm or too cold. Rarely do problems occur but when they do happen to the cannula, reservoir , tubing or the insulin pump, and delivery of insulin which is rapid – acting. If long-acting insulin is not available to the body, ketoacidosis can happen very fast. Therefore, it is necessary to know what to do, such as giving insulin through injections to overcome the problem and replacing the cartridge or the reservoir as well as the infusion set which you ought to have learned while undergoing training in the use of the insulin pump. Insulin infusion pumps as well as infusion systems’ associated components are only sold when it is prescribed for use by a doctor who knows the risks involved in the use of insulin pump therapy. For patients who are not willing or unable to check their blood sugar at least four times each day, the insulin pump therapy is not suitable to them. They should also be able to see and hear well enough to be aware of any alarms or alerts from the pump. Rapid-acting insulin is used in insulin pumps. Should delivery of insulin to the body be stopped, regardless of the reason, the undelivered insulin has to be replaced at once, perhaps by injection. The infusion set needs to be changed every two to three days, sometimes sooner if your doctor advises to do so. For more information on insulin pump insurance coverage, contact Medtronic at 1.800.971.5818.